Died—At Tallmadge (Ohio) on the 4th of June last, Mrs. Cynthia Sackett, aged 18 years, wife of Mr. Clark Sackett, formerly of this state. Died—At North Haven, Mr. Eli Sackett, 84. Marriage—At Ellington, by Rev. Diodate Brockway, Mr. Seth E. Sackett, of Springfield, Mass., and Miss Roxa A. Chapman. Deaths—At Milford, Mr. Jonathan Sackett, aged 88—a revolutionary soldier. Marriage—In this town, on Tuesday morning, 23d inst., by Rev. [? ], C.R.Sackett, Esq., of Candor, Tioga county, N.Y. and Miss Mary T. Gilbert, daughter of Mr. Nathan Gilbert, of this town. Marriages—In Westfield, Jan. 3d. John L. Cooke of Hartford, and Ann F., daughter of Martin Sackett. Marriages—In Jacksonville, Ill., Sept. 24, by the Rev. Charles Marshal, Mr. Chas. S. Daniels, of Memphis, Tenn., and Miss Sarah J. Sackett, formerly of this city. Marriages—In Portsmouth, Va., Aug. 26, Capt William Sackett of the 11th Conn. Vols, and Miss Annie Summers of Portsmouth. The Portsmouth "Old Dominion" speaks of Miss Summers as being beautiful, and the bridal presents singularly rare and superb. Births. Sackett—In Suffield, July 8, a daughter to Horace D. and Ellen M. Sackett. Deaths. Sackett—In Stamford, May 5, James H. Sackett, aged 60 years. Marriages. Abbey—Sackett—In Chester, May 18, Edson J. Abbey and Miss Carrie E., eldest daughter of Dr. C.A. Sackett, all of Chester. Deaths. Sackett—In this city, May 20, Edward Sackett, aged 65 years, 6 months and 23 days. Notice of funeral hereafter. Springfield and Western papers please copy. Deaths. Sackett—In West Winsted, Oct 21, Kate Louise, daughter of P.B. Rockwell, and wife of Grove Sackett of Chicago, Ills. Death of Frank Sackett at the Hospital. Francis W. Sackett, an old compositor, who for thirty years, until about two years ago, worked at the case in the book department of the Case, Lockwood & Brainard Company, died at the hospital yesterday of diabetes. For some time past until about two weeks ago, he had been an inmate of the town house. Sackett was considered one of the best book compositors who ever worked for the company. His work was reliable and his proofs always clean. He had a good bass voice and many years ago was a member of the chorus choir at the Pearl Street Church. He was born in Lancaster, Mass., was 60 years old and was never married. Mr. Sackett's step-brother, C.C. Sackett of Middletown, will come up to-day and take charge of the body. End Came Suddenly Yesterday Morning—Was a Native of Westfield. Springfield, Mass., July 14.—Seymour A. Sackett, sixty-one, died suddenly at his boarding place, 100 Bridge street, about 1 o'clock this morning. Mr. Sackett had been sick for about ten days with a stomach trouble, but no serious results were feared. This morning while attended by a young son who had come on from Revere to see his father, he suddenly passed away. Mr. Sackett was a native of Westfield, where he lived for many years. He came to this city in the early part of May from Fitchburg and was selling a patent tampico brush, in the manufacture of which he was interested. For nearly twenty years past he had been a selling agent through this section for the Singer Sewing Machine company. He leaves a divorced second wife with two young daughters in New Haven, besides seven children by his first wife. Seymour A. Sackett, 61, a native of Westfield, who came to this city last May from Fitchburg and was selling a patent brush, died at his boarding place, 100 Bridge street, yesterday. He was an agent for the Singer sewing machine company for nearly 20 years in this section. He leaves a divorced second wife in New Haven with two daughters, beside seven children by his first wife. He also leaves a sister, Mrs. Ella Shattuck of Westfield. Funeral of G.E. Sackett Tomorrow. The funeral of George E. Sackett, 63 years old, of Canterbury, formerly of Hartford, who died Saturday at the Hartford Hospital, will be held at 2 o'clock tomorrow afternoon at the undertaking rooms of Taylor & Modeen, No. 205 Main street. The burial will be in Zion Hill Cemetery. Mr. Sackett leaves his wife and a son, Fred Sackett, in Canterbury; another son, Leslie Sackett, in New York; two daughters, Mrs. L. Hansen and Mrs. Mabel Nelson, both of Hartford; and a sister, Mrs. August Church of Chester, N.Y.
Miss F. Adelaide Sackett, 85 years old, died yesterday in this city after a long illness. She was a native of Hartford and was a daughter of Loren Sackett and Frances (Smith) Sackett. For thirty-three years she was employed at the office of the Hartford Street Railway Company, resigning as chief receiving clerk at the age of 73. Previous to her connection with the company she was employed in the actuarial department of the state insurance commissioner, having been appointed by Commssioner George S. Miller. Miss Sackett was one of the leading members of the Women's Relief Corps of the state and at one time held the office of department treasurer. She was one of the charter members of Robert O. Tyler, W.R.C. and was formerly president of the Eleventh Regiment Veteran Association. She leaves two brothers, Joseph P. Sackett of Licking, Mo., and William L. Sackett of Morris, Ill. Deaths. / Sackett—In this city, December 22, 1917, Miss F. Adelaide Sackett, aged 85 years. / Services this (Tuesday) morning at 10 o'clock from No. 227 Vine street. Obituary. / The funeral of Mrs. Catherine Reizer of No. 134 Park terrace, was held yesterday at her home, with services at the Sacred Heart Church. Rev. Anthony M. Kaicher was celebrant of the requiem high mass. The bearers were Conrad Butz, Anton Klein, John Kraus, Joseph Sackett, Peter Strunph and Lawrence Gardner. The burial was in Mt. St. Benedict Cemetery. Deaths. / Sackett—In Poquonock, Conn., June 10, 1928, Margaret, widow of William N. Sackett, aged 79 years. Funeral from Elm Grove Chapel Friday afternoon at 3 o'clock, D.S.T. Winsted, Oct. 23.—(AP. )—Frank Sackett, retired banker and business man, and son of Solomon Sackett, an early settler of Colebrook, died today in the Litchfield County Hospital. He was 72 years old. He was a former director of the Gilbert Clock Company, First National Bank of Winsted, Winsted Gas Company and Citizen Printing Company. He retired several years ago because of his health. He leaves his wife, Belle H. Sackett, a son George S. Sackett of New Rochelle, N.Y., and a granddaughter. Funeral services will be held at 2 p.m. at the Methodist Church of which Mr. Sackett was for many years financial secretary and trustee. Rev. Andrew F. Chamberlain will officiate. Burial will be in Colebrook Center Cemetery. West Cornwall, Oct. 18.—(AP. )—Charles A. Sackett, 71, vice-president of the Chase national Bank, New York, died at his summer home here today after two weeks illness. He had been suffering from heart trouble. He leaves his wife and two daughters, Mrs. Eleanor Sureda of West Cornwall and Mrs. Beatrice Hodgman of Bronxville, N.Y. Marriage Licenses. / Malcolm I. Shelley, cafeteria work, East Hartford, and Elizabeth Kline Sackett O'Connor, housework, 63 Center Street. Longmeadow, Mass., May 4.—(AP. )—Word was received tonight that Albert Henderson Sackett, 78, retired actor and father of the radio and stage star, Julia Sanderson, died today in New York City, where he was being treated for an illness. In recent years he made his home here with his daughter and her husband, Frank Crumit. A native of Northampton, Sackett made his first stage appearance with James O'Neill, father of playwright Eugene O'Neill. He was in the original company of "Brewster's Millions" and also played in "Katinka," "Somebody's Sweetheart," "Misleading Lady," and other favorites. He retired 12 years ago. Private funeral services will be held Sunday at Springfield where he will be buried. Baltimore, May 18.—(AP. )—Frederick M. Sackett, 72, former United States Senator of Kentucky and ex-ambassador to Germany, died suddenly in a Baltimore hotel at 9:30 a.m. today. The senator was in Baltimore with his wife who is convalescing from a recent eye operation. He attended the annual meeting of the Association of Harvard Clubs. Senator Sackett was appointed by former President Hoover in December 1929, to succeed Dr. Jacob Gould Schurman as American ambassador to Germany. He relinquished the post in 1933. Senator Sackett was born in Providence, R.I., December 17, 1868, received a bachelor's degree from Brown University in 1890 and three years later his law degree from Harvard. After Harvard, he ppracticed law at Columbus and Cincinnati, went to Louisville in 1898. There he married Miss Olive Speed, member of one of Kentucky's wealthiest families. He continued as lawyer until 1907 when he virtually abandoned legal pursuits in favor of coal, public utilities, banking, real estate and cememnt interests. Always connected with civic affairs, the senator served as Federal food administrator for Kentucky and as directorof the Louisville branch of the St. Louis Federal Reserve Bank. In 1924 he received Kentucky's Republican nomination for senator and defeated Senator A.O. Stanley who sought reelection. He resigned the Senate in 1930 to accept President Hoover's appointment as ambassador to Germany. A few months after the Reichstag fire in 1933, he resigned his post, returned to the United States and seldom spoke of the genesis of the Nazi rise to power, despite the many interviews sought of him on that subject. Senator Sackett figured in the news again a year later when his wife's niece, Mrs. Berry V. Stoll, was kidnapped. With her abductor asking for a $50,000 ransom, one of the largest manhunts in Kentucky was launched, with county, state and Federal officers participating. The ransom was paid to the kidnapper and later Mrs. Stoll was found unharmed in an Indianapolis apartment house. A short time later, Thomas H. Robinson of Nashville, Tenn., was captured at Glendale, Calif., and sentenced to life imprisonment for the kidnapping. Since then, Sackett has remained in the background, tending to his Louisville business interests. Larchmont, N.Y., Nov. 26.—(AP. )—Lieutenant Colonel Holland Sackett Duell, 61, lawyer and holder of a World War I Distinguished Service Cross, died yesterday. Born in Syracuse, N.Y., he attended Yale and New York Law School. Until his partial retirement a few years ago he specialized in patent cases. In the first World War he served with the Three Hundred and Sixth Field Artilllery, Seventy-seventh division, winning the Distinguished Service Medal, and the Croix de Guerre in addition to the DSC. A former New York state assemblyman and senator, he leaves his wife, three sons and two daughters. SACKETT. Margaret (Carey) Sackett, 88, of West Hartford, died Monday (Jan. 7, 1991) at St. Francis Hospital and Medical Center. Born in Norwich, she had lived In West Hartford for the past 40 years. She leaves her husband of 65 years, William L. Sackett of West Hartford; four daughters, Marjorle S. Abbott of Wethersfield, Marian L. Sackett of West Hartford, Margaret A. Sackett of Orlando, Fla., and Ann S. Irving of St. Charles, Mo. ; 11 grandchildren, and eight great-grandchildren. The funeral will be Friday, 9:30 a.m., from the Molloy Funeral Home, 906 Farmington Ave., West Hartford, with a mass of Christian burial, 10 a.m.. In St. Thomas the Apostle Church, West Hartford. Burial will be In Fairview Cemetery. Friends may call at the funeral home Thursday, 3-5 and 7-8 p.m. Donations, in her memory, may be made to St. Elizabeth House, 118 Main St., Hartford 06103. SACKETT. William L. Sackett, 91, of West Hartford, husband of the late Margaret (Carey) Sackett, died Saturday (June 8, 1991) at St. Francis Hospital. Born in Revere, Mass., he had lived in West Hartford for 40 years. He was a retired vice president with the former Roberts, Steele & Dolan, wholesale grocers. Mr. Sackett was a long time member of the Kiwanis Club of West Hartford, the West Hartford Squires, and the Golf Club of Avon. He leaves his daughters, Marjorie S. Abbott of Wethersfield, Marian L. Sackett of West Hartford, Margaret A. Sackett of Orlando, Fla., Ann S. Irving of St. Charles, Mo. ; 11 grandchildren; and eight great-grandchildren. The funeral will be Tuesday, 9:30 a.m., from the Molloy Funeral Home, 906 Farmington Ave., West Hartford with a mass of Christian burial at 10 a.m. in St. Thomas the Apostle Church, West Hartford. Burial will be In Fairview Cemetery. Friends may call at the funeral home today from 3-5 and 7-8 p.m. Donations in his memory may be made to St. Elizabeth House, 118 Main St., Hartford 06103. Last week, officials solved a North Haven mystery when they located a long-missing, two-centuries-old tombstone. Clinton's Sgt. Jeremiah Dunn recently reported that the town's Police Department found a 215-year-old gravestone while cleaning out the old Clinton police building. Through an Internet search, Clinton officers learned that a North Haven family was a likely source for the tombstone. In 1888, North Haven's Town Historian Sheldon Thorpe recorded an inventory of all the graves in the Old Center Cemetery on Town Green. In this inventory was the grave of Mrs. Ruth Sackitt, who died on March 27th, 1796. Born in 1755, she was the third wife of Mr. Solomon Sackitt. It is unknown when Sackitt's headstone went missing but it was recorded as such by Gloria Furnival in her book On-The-Green, published in 1995. The consensus of opinion at the Clinton Police Department is the headstone was entered into their evidence system in the 1970's. However, the reason why has been lost to history. North Haven Police Chief James X. DiCarlo assigned to the case Office Ted Stockman, who enlisted the aid of North Haven's Historical Society. It was determined that the gravestone definitely belonged in the North Haven Center Cemetery on the North Haven Green. It is one of approximately 25 grave stones that have been reported missing over the years. In Clinton the headstone was discovered underneath debris by Public Works employee Jeff Heser, while the clean out was underway for building remodeling. Ten years ago, Clinton Police moved to a new site. Now the mystery begins. The headstone is a typical, ornate marker from Colonial times. It includes the verse Death is a debt to nature due, that I have paid and so must you. Many Colonial headstones display verses the author felt appropriate. Complicating the mystery was the gravestone's spelling of Sackitt, a surname known locally today as Sackett. However, it is relatively common for spellings of family names to evolve and change over time—Ellis Island's affect comes to mind. It is more probable that legal documents drawn up by town clerks contained misspellings, and the alterations were adopted by the subject of the document. A probable exception to this was the masons who carved the stones. 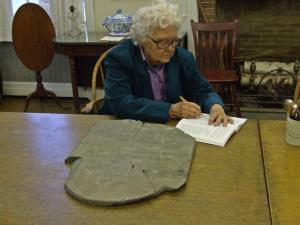 The North Haven Historical society has a collection of stones that were never finished because they contained errors. Many of the masons who worked in North Haven did so for periods of 10 years, carving numerous stones. Accuracy in the stones was very important to them. Unfortunately, the headstone is broken into three pieces. Lynn Fredericksen, vice chairwoman of the North Haven Cemetery Commission, said We will have it properly reinstalled on her grave as soon as we can. The stone will be retrieved from Clinton's Police Department and will be stored at North Haven's Historical Society to give the Cemetery Commission time to develop a plan for the repair and placement of the headstone. So, after 40 years, Mrs. Ruth Turner Sackitt's headstone will return to the Old Center Cemetery. On any nice day you can observe people, many with their children, touring the graveyard on Town Green. Here is the history of North Haven. It is now one step closer to being complete. Anyone interested in further research should visit the North Haven Historical in the Cultural Center on Broadway. The center is open on Tuesdays and Thursdays from 3 p.m. to 6 p.m. The public is welcome. "Ivy J. Rajotte, 91, of Newington, CT died peacefully at her home on Monday, September 24th. Ivy was born in London, England on May 24, 1927 to Margaret and Jeremiah Sackett. She left London at age 19 and moved to Boston Massachusetts to marry her husband, Victor E. Rajotte who she met at a dance at Epping Air Force base in England during World War II. They moved to Newington, CT in 1954, where she started a family and continued to live for the past 64 years. Ivy loved to garden and her beautiful flowers were enjoyed by all. Ivy touched many people as the town cosmetician. She worked for many years at Thrifty Drug Store and over the years she assisted many women in Newington with their beauty needs. She was always able to bring out the best in people, both physically and spiritually, and always had an open seat at her counter if anyone needed to talk. According to her clientele, she dispensed friendship and self-confidence along with beauty and makeup tips. Ivy was predeceased by her loving husband Victor Rajotte, her parents Margaret and Jeremiah Sackett, and her sister Ann Thompson. She leaves her children, Victoria Woodward (Pete) of Edmund Oklahoma, Gerry Connelly (Ned) of Hamden, Jeff Rajotte (Trish) of Rocky Hill and Brett Rajotte (Ronda) of Lake Forest, CA. She also leaves 13 grandchildren, 7 great-grandchildren and Julie McManus her caretaker for the last 5 years. Ivy's two cousins, Maisie Carter and Jim Sackett and her nephew Jerry Thompson and niece Carol Carey were her British connection to her beloved England. We would like to thank the wonderful workers from Constellation Services for their wonderful hospice care given to our mom. Funeral services for Ivy will be held on Saturday, September 29, 2018, at 11:30 a.m. at the Newington Memorial Funeral Home, 20 Bonair Ave., Newington. She will be lovingly laid to rest with her husband in West Meadow Cemetery. Family and friends may call on Thursday, September 28, 2018, from 4:00 p.m. to 8:00 p.m. at Newington Memorial Funeral Home, 20 Bonair Avenue, Newington. To share a memory with Ivy's family, please visit us at www.newingtonmemorial.com." The North Haven Citizen, online edition (http://northhaven.ctcitizens.com/).